Our global food system is undergoing rapid change. Since the global food crisis of 2007-2008, a range of new issues have come to public attention, such as land grabbing, food prices volatility, agrofuels and climate change. Peasant social movements are trying to respond to these challenges by organizing from the local to the global to demand food sovereignty. As the transnational agrarian movement La Via Campesina celebrates its 20th anniversary, this book takes stock of the movement’s achievements and reflects on challenges for the future. It provides an in-depth analysis of the movement’s vision and strategies, and shows how it has contributed not only to the emergence of an alternative development paradigm but also of an alternative conception of human rights. 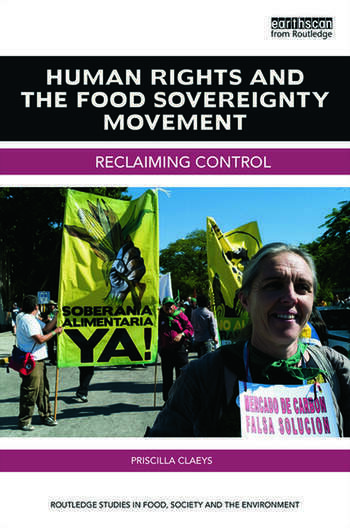 The book assesses efforts to achieve the international recognition of new human rights for peasants at the international level, namely the 'right to food sovereignty' and 'peasants’ rights'. It explores why La Via Campesina was successful in mobilizing a human rights discourse in its struggle against neoliberalism, and also the limitations and potential pitfalls of using the human rights framework. The book shows that, to inject subversive potential in their rights-based claims rural social activists developed an alternative conception of rights, that is more plural, less statist, less individualistic, and more multi-cultural than dominant conceptions of human rights. Further, they deployed a combination of institutional (from above) and extrainstitutional (from below) strategies to demand new rights and reinforce grassroots mobilization through rights. Priscilla Claeys received her PhD in Political and Social Sciences from the University of Louvain (UCL) in 2013 and is now a Postdoctoral researcher. Priscilla worked as an Advisor to the UN Special Rapporteur on the right to food from 2008 to 2014. She previously worked for a number of human rights organizations and development NGOs. Her research interests include transnational agrarian movements, human rights, alternative food economies and the ecological transition.